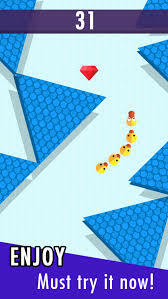 For all of the fans of ★snake games★ around the world, Asktolik is proud to present you Impossible Road - Arrow Skills! Move the arrow through the maze without making the snake’s arrow head hit the walls. Collect points to grow your tail. Smash gems to unlock cool new arrow heads and backgrounds. The game includes unlimited life for hours of great fun and excitement! Everyone knows the amazing old school snake game: one of the most addicting and funny games created ever. Here at Asktolik we decided to develop a new challenging version of this real legendary game, improving the graphic and the game play, to give to our users one of the most exciting and entertaining game play experiences ever! note it in your review!!! Impossible Road - Arrow Skills brings us back to our childhood years, when we were playing with the snake 97 retro phone classic game and try to eat all the apples using our Nokia phone. Now, thanks to our innovative technology, we can experience this new amazing adventure: download Impossible Road Test now for FREE!!! The Task in the game is grow the tail of the worm and make the best score you can don't mill it! Make it! You can also share with us your score and show us how good are you, if you in middle of the way home in train or bus it's great way to spend your time it's very simple one touch game so everybody can play kids and adults.